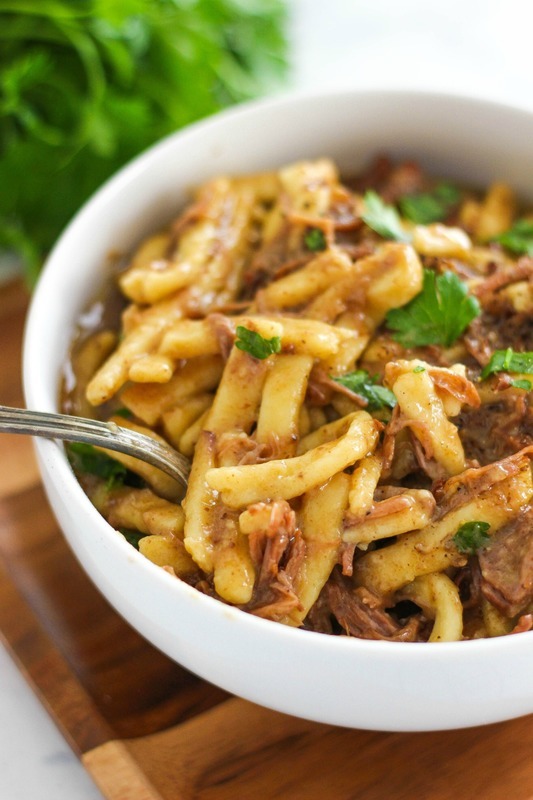 Easy Slow Cooker Beef and Noodles is a simple comfort meal recipe that the whole family can enjoy. This post is sponsored by Reames Frozen Egg Noodles. All opinions are my own. With my family the holidays are all about traditions and hearty food. We love warm comfort food during the winter months and one of our favorite meals is beef and noodles. This Easy Slow Cooker Beef and Noodles recipe tastes just like homemade but is so much quicker to make. 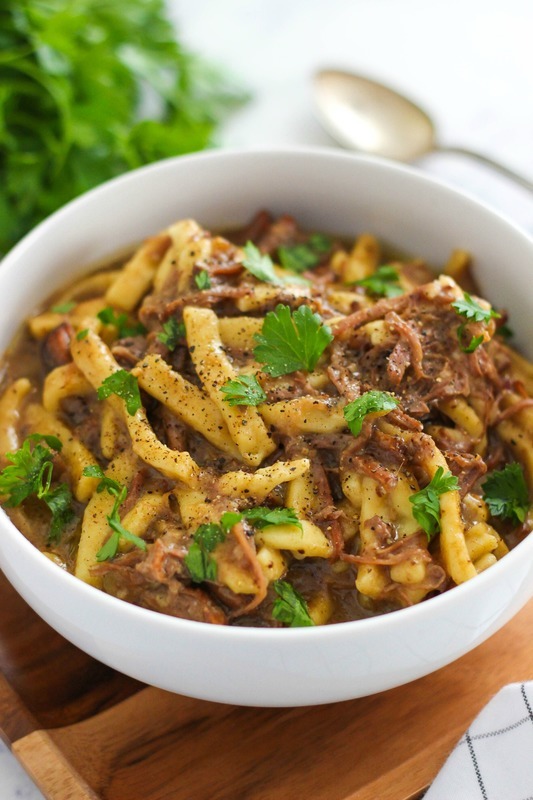 For this slow cooker recipe we are using Reames Frozen Egg Noodles. You get the taste, texture and simple ingredients of homemade and they are down right yummy. They hold up well during the cooking process and pair so nicely with the seasoned beef. Eggs, Flour, Water—just like how you’d make them from scratch. I love the convenience of the frozen noodles and they taste so much better than dried noodles. 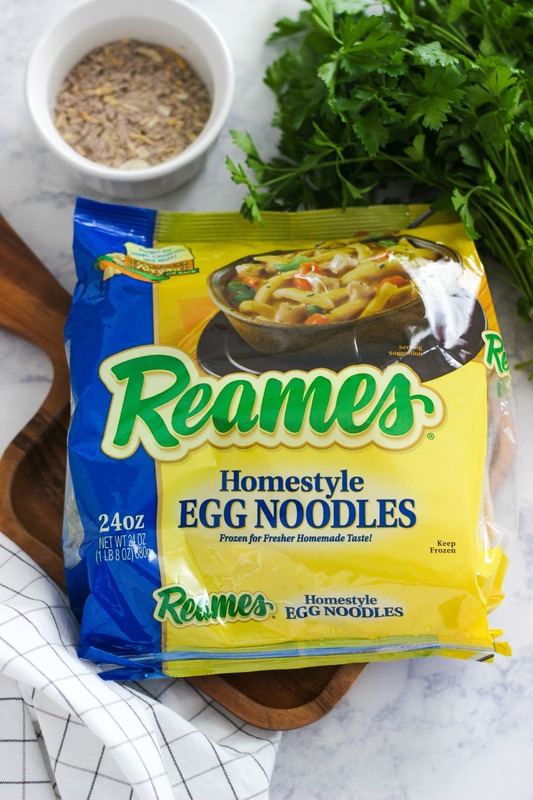 Click here to find out where to buy Reames noodles. This recipe is made entirely in the slow cooker saving you time cooking and doing dishes. When family and friends come over you want to visit with them instead of being in the kitchen, am I right? 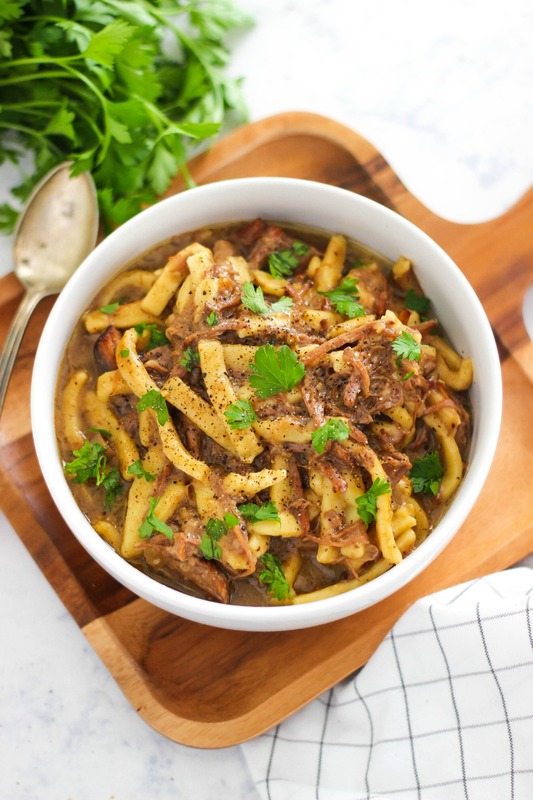 Try this Easy Slow Cooker Beef and Noodles recipe the next time you have company and see the frozen noodle versus dried difference for yourself! Easy Slow Cooker Beef and Noodles is a simple comfort meal recipe that the whole family can enjoy. Place beef roast in slow cooker. Sprinkle onion soup mix on top. Add mushroom soup and garlic and smear on top of roast. Add beef broth. Put lid on crockpot and cook 9 to 10 hours on LOW. Remove lid and shred beef using 2 forks. Add noodles and enough water to mostly submerge the noodles. Cook for 1 hour. Check for seasoning and add salt and pepper to taste. During these cold, winter months nothing is quite as comforting as warm, homemade soup! Our friends at Reames are giving away a $50 Visa Gift Card to one lucky Simple as That reader. Comment below telling us one of your favorite soups to make this chilly time of year. I love my slow cooker Potato soup with ham recipe this time of year! I’m looking forward to trying the beef and noodles- sounds wonderful. 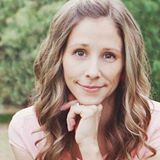 Thanks for sharing the recipe and for the giveaway! My favorite is bok choy and shiitake noodle soup. Our favorite soups are chili (with cornbread!) and Senate Bean Soup. Right now I’ve been loving carrot ginger soup!!! I love potato chowder but right now we have the roast cooking to try the beef and noodles recipe! Our favorate is roasted chicken soup with lots of root veggies and Reames noodles. I love making my grandmother’s recipe for chicken soup with dill in the winter! I like making my mother’s minestrone soup, it;s the best. My favorite soup is gumbo. I like my dad’s recipe using his homemade andouille sausage and chicken. I love to make chicken noodle soup. It’s a winter favorite. I love to make spicy chicken tortilla soup. I like to make french onion soup. My favorite is cream of chicken dumpling soup! I actually thaw these noodles a bit, cut them into bite size “dumplings”, add to soup, yum!! I like to make a spicy vegetable soup. My favorite to make is broccoli cheddar soup! I like homemade chicken noodle soup. Nothing beats chicken noodle soup but sometimes I give it a little chinese flair by adding ginger, soy sauce, sesame oil and garnishing with the green tops of scallions…yum! I love to make a big pot of chili on these super cold evenings! I love taco beef soup…we love Mexican & itialain foods but this soup is BIG in flavors & filling as well! My all time favorite soup is Oxtail soup. Chicken noodle is my favorite with these noodles. But looking forward toctrying this recipe. Italian wedding soup with homemade meatballs is one of our favorites. Can’t wait to try this recipe! My husband’s cheesy Potato soup with sausage. 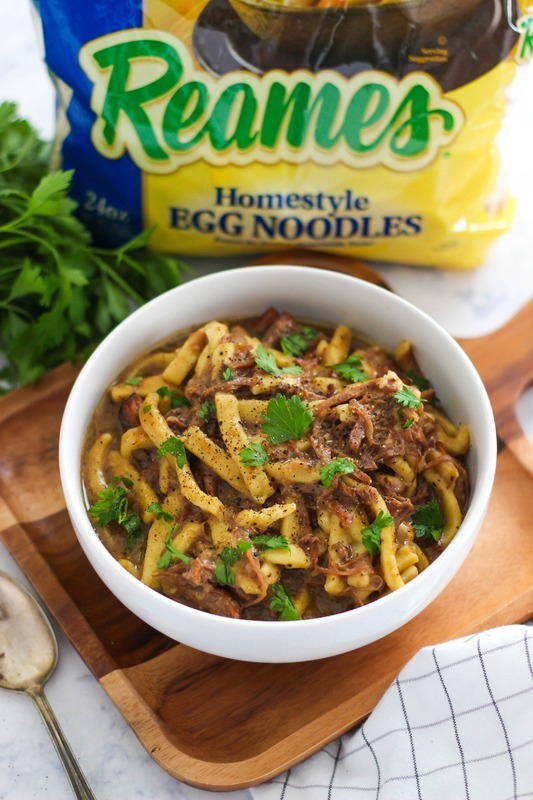 I’ve made a hearty chicken and noodles meal using Reames noodles much like your recipe for the slow cooker beef and noodles for since my grown kids were small. It’s by far their favorite meal and always what they request above anything else for their birthdays! Zoupa Toscana is one of the best chilly weather soups that me and my family love. You can’t go wrong with a delicious vegetable beef soup! I started using Reames noodles on the advice of a friend. I love using them in my homemade chicken noodle soup which is a favorite of my family. Love to make a sausage tortellini soup and chili!! I make “Comfort Chicken Noodle” soup with Reames homemade noodles that is to die for!